Your research process produces feedback that individual employees and teams need to understand and react to. Let’s consider the simplest and most common use of the Inner Loop: ‘episode’ research. A customer has a query of some sort and wants it resolved. Let’s suppose they have filed an insurance claim. An agent in your team has just finished a call with a customer to let them know the payment has been made to their bank account, and closed the incident in your CRM system. The system automatically sends a feedback request about the whole claims experience to the customer. (The agent has of course told the customer to expect it.) Surprise, the customer says the payment was not received, but they were since able to find a different way to solve the problem on their own. First, this feedback needs to go directly back to the agent concerned. Personally, I feel it should go back without human intervention if possible. I don’t see a reason that the agent’s manager would need to know, depending on how the agent reacts of course. While I have picked an unsolved problem as the example, the agent should get all positive, negative and neutral feedback directly. Ideally the agent or his / her peers or manager should follow up with the customer to thank them for the feedback, no matter what it is. The call should happen within 24 hours, preferably much more quickly, before the customer forgets about what they have written. Unfortunately, most companies say they are not able to afford the ideal process and only call back the Detractors, at best. (I can’t count the number of Detractor responses I have given to Air France and Sabena surveys without ever being contacted in any way.) If you have made the (bad) decision that you can only afford to call the worst Detractors, start with just those who gave you a zero or 1. There is no formal script for such calls. You need to apologize, then have a discussion. Apologizing works, and you must do it on behalf of the company. “I am sorry we screwed up.” not “I am sorry they screwed up.” Whatever your cost limitations, you must at least thank every customer who took your survey for doing so. Even if you use a standard email for this, it should come from the head of the appropriate department and give examples of improvements that have come from prior customer feedback. The department head’s email and phone number should be included, with an invitation to call or write. That won’t cost much and at least your angriest customers get a way of sharing their anger directly with you, rather than just spreading it across the Web. It is obvious when people are speaking to you from a script. It comes across as insincere. You need a formal or informal expert system for the unscripted call-back dialog to be consistent and provide value. The best informal system is coaching from a supervisor, supplemented by discussions with team-mates doing the same type of work. Team-mates can help during live calls if you have an instant messaging system. “Let me just check whether any of my colleagues have seen this.” Then a short message to the WhatsApp or Slack group for the team, for example. I have also seen this work in a small software development team where the person taking the call would simply (and audibly to the person on the line) talk to a more expert person near them to resolve the situation. If a customer has told you they would definitely recommend you and that the latest transaction has made this even more likely, you need to have a ready way of activating them; meaning letting them actively promote you. In many businesses, you could simply thank the customer and say you would really appreciate it if the customer could write a product review on a specific website. You may also like to invite them to join your user group or give them a free ticket to a company event. 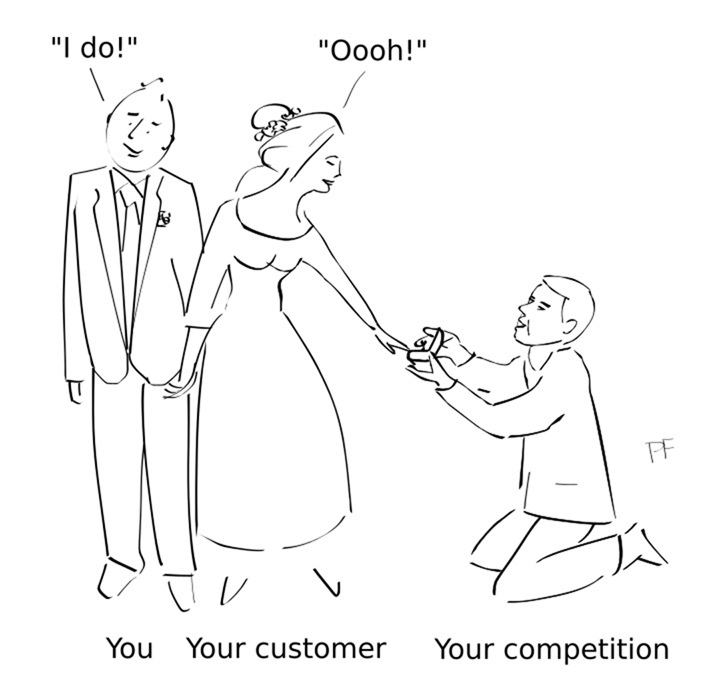 Transactional feedback comes mainly from end users of products and services. In B2B situations, they will not normally be the ones making the purchase decisions. End users have a more direct impact in consumer businesses. In businesses where the cost of change is high, Passives are the category that are most likely to leave you. This is the case for B2B companies that sell things on the basis of an annual contract, or who have dominant market shares in some area. While that may seem surprising, there is a certain logic to it. Passives usually represent about 40% of your customers. You tend not to talk to them much, if at all. The Detractors get lots of attention and often wind up happy. The Promoters are people we like to talk to because they love us. The Passives? The typical attitude of most companies is “Well, they are not complaining, so I am sure everything is going just fine. No need to talk to them.” If you have any competitors, this is a disaster. You have to assume that your competitors are already talking to your Passive customers, and being particularly nice to them. If you seem to have forgotten about them, they will leave you. Of course you can try to stand that on its head, work out which of your competitors’ customers are their passives, and start to talk nicely to them. How should you prioritize follow-up if you do not have enough people to call everyone? Your top priority should be the people who have provided long responses to the verbatim questions. They care. They have taken a lot of time to provide thoughtful input. You should take at least as much time to call them back and discuss their input. Anyone who provides lots of suggestions is a potential Promoter, regardless of current status. The second priority is your Detractors. Of course, if you don’t have the resources to call anyone back, you really should not be surveying. Many teams use email to discuss and resolve complex customer situations where people outside service center operations have to get involved. It is not a great solution. Email makes it difficult for people who have just joined the conversation to catch up on what has happened up to then. The use of CCs in email chains may mean that no single individual has the full picture. Sophisticated instant messaging systems like Slack may help if you want to be able to view and search the entire conversations easily. It is tricky to find a good balance, as people who only need to contribute something to a small part of the discussion should not have to be notified of every additional message. Next time: the Outer Loop. As is usually the case, this post is an edited version of a chapter in one of our books; in this case Net Promoter – Implement the System. Like all of our books, it is available in print and Kindle formats from Amazon.